Wanna buy your dream car ? And drive in your city ? Maybe it's hard but not impossible. Anything is possible if you believe in yourself and take some smart decision. If you think to buy your dream car, You should make a master plan in your mastermind. Decide your car budget and Set a goal in your mind and Ask yourself that how much time it takes to achieve your goal. In this article, I will give you some smart tips which may help you to buy your dream car. Stop to buying all the useless things. And try to save your money. It will help you to increase your bank account. Before buying anything ask yourself that is the thing necessary for you ? if not then don't buy. no money left the end of the month. Saving habit is most important. You should adopt this habit. If you work for a company and your monthly income is $30,000.Then try to save $20,000 . Make a budget list and start saving today. You can save your money in your bank account. If you don't know to save you money then there is a high chance that you will never become rich in your life. But, Saving is not enough If your dream car is too expensive. Don't worry. I will give you some investing tips which may help you. 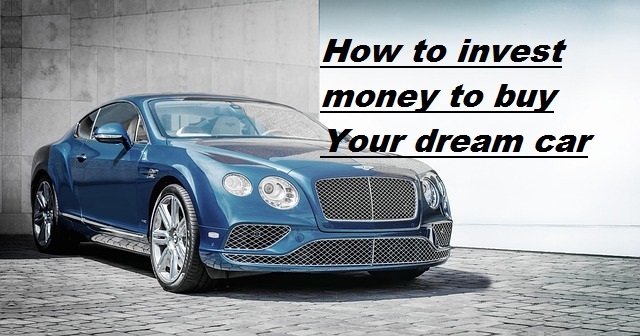 Smart investment definitely helps you to achieve your dream car. Your bank account can't give you a high return. But investing can. That's why you must invest your money. Investing will help you to a wealthy person. 5.National pension system (NPS) etc. Before investing your money anywhere, ask yourself that which platform suits you. If you want to take the risk then i will suggest you to invest in stock market. Stock market gives high profit. But i noticed that many people came to stock market without any knowledge. That's why they lost their money. And if you don't want any risk then i will suggest you choose the Mutual fund, bonds etc. When it comes to investing most people scared and think that investing is risky & hard. Investing is not hard. But you should take a smart decision before investing your money. Money will work for you if you can do investing properly. I hope this information will help you to achieve your dream car. If you like the article, Please share on social media.